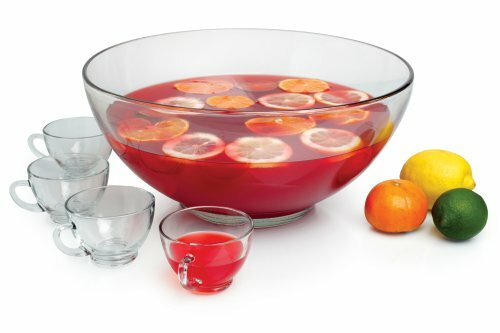 What’s nice about my Thanksgiving cranberry punch recipe is that it can be made well in advance and stored for Thanksgiving Day as part of my Toni’s 12 Days of Thanksgiving. Bring one quart of water to boil with cinnamon sticks, cloves and ginger (you can also put cloves in a tea steeper, or directly in water). Once boiling, reduce heat and let steep for an hour. Strain cinnamon sticks and cloves from the tea. Transfer tea to a container to chill in the refrigerator. Before serving, combine tea with juice and soda. Wait until just before guests arrive to place Cranberry Ice Ring. You will want to make and freeze your Cranberry Ice Ring for your Sparkling-Spiced Cranberry Punch ahead of time and today is the perfect day to do it. To make the ring, I use a plastic chip-and-dip server because it has the hole in the middle, like a bundt-cake pan. Pour thawed juice into mold. Add water to about two inches below rim. Add cranberries to float on top. Wait until just before guests arrive to place in punch bowl.